CERAMIC COAT is a division of Pacemaker Headers. For enquiries, call (08) 8354 2066. This will depend upon many factors that will vary from application to application. Testing has shown significant power increases on a dyno. In addition certain changes can be made in such areas as tolerances, timing, jetting and the lubricants used, that will increase torque and H.P. and are only possible through the use of coatings. Depending on the coating, part life increases from two (2) to ten (10) times what is normal can be seen. In addition coatings such as CERMAKROME can provide virtual lifetime protection against rust. Parts will run cooler. Engine oil and water temperatures have shown a reduction. On headers the radiated heat will be substantially reduced leading to lower underhood temperatures and less heat absorption by nearby parts and surfaces. Does it matter how thick the coatings are put on? YES, the coatings are thickness sensitive. Putting any coating on too thick can cause the coating to crack, flake or bubble up. Why is Black Satin a better thermal barrier than Cermakrome, since black should emit more heat than a silver coating? While it is true that black normally is a better colour to emit heat, in this instance the colour is not as important as the fillers in the coating. These fillers are very effective insulators, sufficiently so that the black colour does not affect the function. Interestingly the silver colour of CERMAKROME or any other Metallic Ceramic Coating comes from the aluminium filler. Aluminium is a very good conductor of heat. Yet the effectiveness of these coatings are not degraded. This type of coating (metallic ceramic) is used by more companies and manufacturers than any other material. It is extremely popular on exhaust systems, where the high luster finish provides a very attractive, durable surface. The high temperature characteristics of ceramics have been combined with metallic frits to create a coating that can withstand metal temperatures in excess of 1300 degrees F and provides 5000 hr. salt spray protection. A truly unique coating that is based on a water/solvent system, may be applied to a variety of surfaces and metals, such as: exhaust system components, brackets, valve covers, hinges, grills, suspension parts or any metal part that can withstand the 500 degrees F cure temperatures. Polishes to a high luster, stainless/chrome appearance that will not rust. The most advanced exhaust system coating available. It is a very durable ceramic reinforced coating available in a variety of colors. When properly applied it becomes the most effective thermal barrier coating available, increasing performance, while extending component life & has been tested to over 2000 degrees F without lifting, cracking or flaking. Unlike header wraps, it does not hold potentially damaging heat & moisture around the part. Rather, the surface temperatures are actually reduced, extending the life of the part. When cured, a very effective corrosion inhibiting film is formed that protects the part against oxidation and imparts excellent chemical resistance that further extends part life and enhances appearance. Ceramic stands above all other thermal barrier coatings currently being used in combustion chambers. Ceramic has characteristics shared by no other product, providing an unrivaled layer of thermal protection to piston tops, aluminum heads, stainless, iconel and titanium valves. Ceramic "moves" heat, reducing detonation and increasing the effective oxidation of fuel. When "polished", it provides a highly reflective surface that further aids in improved flame travel. Unlike previous ceramic coatings, ours is not subject to cracking and flaking, which can lead to extensive engine damage. In fact, Ceramic coatings actually strengthen the coated part. The cured "Cermet" provides a cap of material that can withstand far more heat. During testing, when sufficient heat was applied to a piston to melt the aluminum, the Ceramic did not melt, rather it held the softer aluminum together. 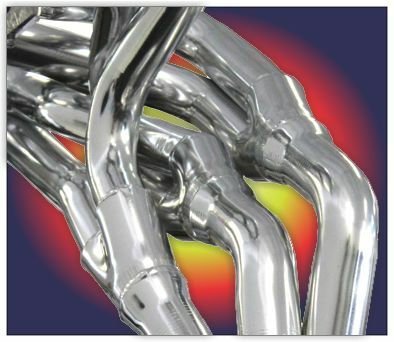 Thermal Barrier is an excellent heat barrier and is recommended for the bottom of intake manifolds & exhaust crossovers to reduce heat transfer. It may also be applied to windage trays, crank scrapers and crankshafts for oil shedding. In certain instances Thermal Barrier may be desirable on the inside of oil pans where good heat retention is desired, such as at drag races, where oil in the pan may become cold while waiting in staging lanes. Thermal dispersants create a chemical and corrosion resistant film that increases the ability of a coated part to radiate heat. TDC provides for more even distribution of heat over the coated surface and moves it rapidly away. TDC is blended with lubricating agents which aid in keeping a coated part clean. Dirt and debris cannot get a good grip and become easier to clean off. The appearance of coated parts depends on the surface texture, the coating will show a semi gloss appearance on machined surfaces and a satin appearance on rough textures. Both finishes are very eye appealing. Dry-Film Coating is a moly-based lubricant capable of providing lubrication at levels as high as 350,000psi. The lubrication aids in preventing scuffing and galling, increasing part life. It also reduces friction, freeing more useable power. This lubricant provides extra protection by preventing damage from oil film failure. Dry-Film Coating is actually impregnated into the metal surface so no dimensional changes are realized. In addition to lubrication, Dry Film Lubricants also help distribute heat so less metal fatigue is caused reducing the chance of part failure. Examine the following table and look at the amount of temperature drop that the coated header shows! Header wraps provide a similar drop in temperature but do not provide the internal corrosion resistance that ceramic coatings provide. Exhaust gases are extremely corrosive and have a tendency to deteriorate headers from the inside out. By coating both internal as well as external surfaces coating not only reduces temperatures but also maximizes corrosion resistance. It has been determined that engine efficiency improves by 1% for every 10° degree drop in under-hood temperature. If we were to use the above data, we could reasonably assume that we would obtain a 50 horsepower increase on a 500 horsepower engine. Where else can I use these coatings? Coatings are used as decorative finishes as well as functional coatings.